Post originally published on the VentureWell blog on July 5, 2016. I had the honor to be interviewed by VentureWell recently. Now you can learn more about MCAD’s relationship with VentureWell through this bit of shameless self-promotion. There are many entrepreneurship educators within the VentureWell network that are creating a positive impact in the innovation and entrepreneurship ecosystem. These educators challenge the nation’s future innovators to think differently in order to create a social and global change. These faculty are featured in our Faculty Spotlight series, where one such individual each month is featured in conversations about what drives their work. This month’s faculty spotlight is Cindy Gilbert, Director of the MA in Sustainable Design program at the Minneapolis College of Art and Design. 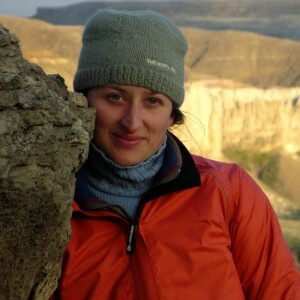 Cindy first heard of VentureWell and its grants program from an affiliate school while working at the Biomimicry Institute. She attended our annual Open Conference in 2010 to see what opportunities VentureWell holds, and has been connected ever since! Watch Cindy Gilbert talk about the impact of sustainable design. Through my students. As we rolled out the MA in Sustainable Design at MCAD, more and more students were coming up with sustainable innovations that they were interested in taking to market. This spurred us to apply for a VentureWell course and program grant to support the development of an entrepreneurial course in the MA program. My favorite thing about teaching is my students. They continually surprise and inspire me with their creativity, passion and determination. I swear that they teach me as much as I teach them! I would really love to see more entrepreneurship support and networking happening in an online capacity, especially for students that don’t have access to entrepreneurship courses and mentors at their home institutions. Also, it is my hope that more innovators will begin to think about the impacts that their designs and businesses have on all people and the planet. In five years, I’d be very pleased to see every entrepreneur considering sustainable design practices at the outset of their work, rather than an afterthought or not at all. I like to take lessons I learn from seemingly disparate disciplines and apply them to what I do and teach. I recently read a book called An Imperfect Offering (2008) written by James Orbinski, M.D., former Médecins Sans Frontières (Doctors Without Borders) director. This book was enlightening to me because it told a story of passionate, dedicated and educated people working to make a difference to the peoples of the world that are struggling the most, and about the inherent challenges and contradictions that come to light when working to do your best with limited resources, funding and power. The same type of challenges face sustainable designers: how to create products and services that the world needs and might even improve the planet, while being a competitive business. Resources, capital and power are lacking to support sustainable innovation today but with know how, grit and passion, we can make impactful change. Currently, sustainable design is an imperfect offering that is growing and changing the more we apply sustainability frameworks at a global scale to solve social and environmental sustainability challenges. It isn’t easy and it isn’t perfect but it is a worthy challenge for responsible design, and I believe this is where design, innovation and entrepreneurship is headed. I believe the most useful assignments in any classroom are real-world projects and challenges. For example, having students working on their own innovations and doing real customer interviews is a great way to move from exercise to reality. 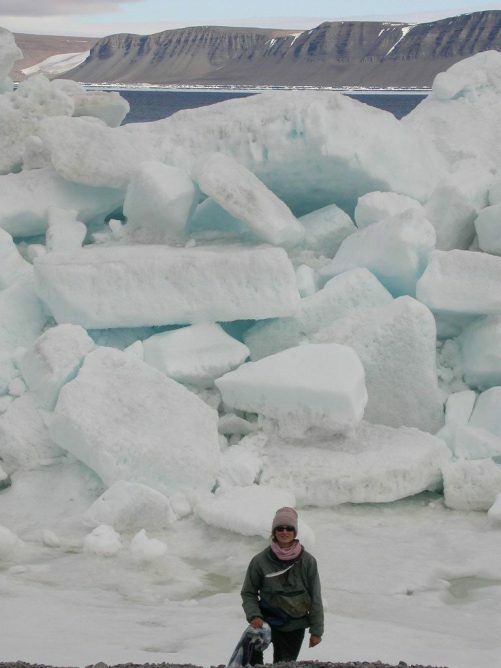 Photo from Cindy’s past life as a polar seabird ecologist. Picture set off the coast of Ellesmere Island in the Canadian High Arctic.